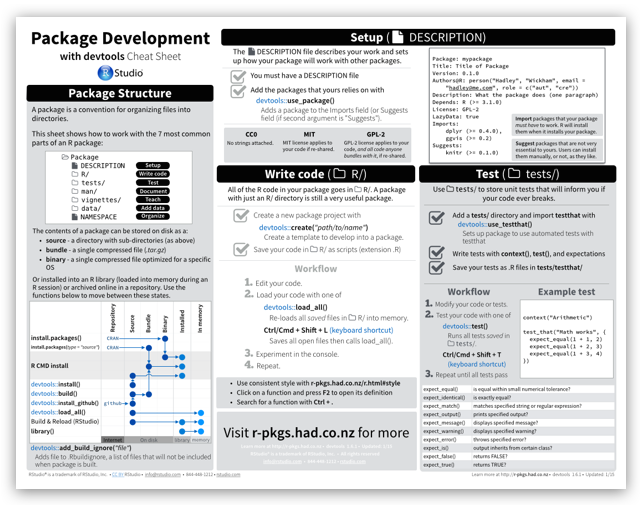 The sheet focuses on Hadley Wickham’s devtools package, and it is a useful supplement to Hadley’s book R Packages, which you can read online at r-pkgs.had.co.nz. Bonus - Vivian Zhang of SupStat Analytics has kindly translated the existing Data Wrangling, R Markdown, and Shiny cheatsheets into Chinese. You can download the translations at the bottom of the cheatsheet gallery.